A service book must be maintained for every full time Govt. employee. Head of the Office is responsible to open service book in duplicate immediately after the joining of an employee. One copy shall be kept under the custody of the Head of the Office. Another copy shall be given to the employee. Every step of an en employee’s service life must be recorded in the service book. Each entry is also to be attested by the head of the office. As per direction of the head of the office the employee shall submit the service book every year for verification. After necessary entry the same will be returned to the employee. Both the copies of service book shall be treated as original. Date of Birth of the employee. Statement whether medical and police verification reports are satisfactory. Statement whether name or surname has been changed. Copy of nomination for death gratuity, group insurance, GPF etc. should be attached with the service book. 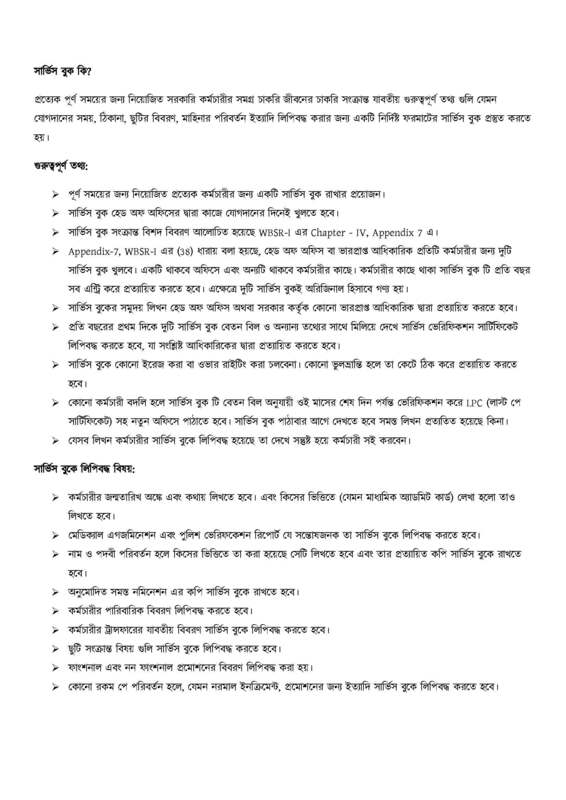 Family details as per Appendix I of DCRB Rule is to be written. While an employee is transferred, up to date entries is to be made in the service book and is also transferred to the head of the office of the new place of posting. As such the service is to be verified by the head of the office up to the date of last pay drawn from his office. Head of the office should show the service book to the concerned employee and obtain signature from the employee each year. In case of transfer to foreign service the head of the office or department shall send the service book to the Audit Officer as the Auditor General may prescribe. No entry is to be attested while on foreign service by any authority other than the Audit Officer. After re-transfer to the Govt service the service book is again sent to the Audit Officer for necessary noting. I have to transfer my service book from one district to another district as the district changed in 2012. Please mention the procedure to do it. One of my friend got madhyamik qualification service in wb govt. He give only madhyamik for pvr. On the date of appointment he recorded graduation qualification in the service book by showing his original certificate of graduation to the appointing authority. Will he suffer from any problem in future? Sir you all are there to maintain the schools. We know that lots of works you had to do during and except school hours. And we techers had to take more classes than you and we do it for the sake of students partially for schools’ reputation. Then why are some of you show negligence about completing service books of the staffs. Some we were an asstt. teachers too and some of you may had problem with your previous head master. So why are you doing the same thing to some us. if you hampers someones career will think that you will forgiven by those who are dependent to that teacher. So Sir stop doing that cause this may lead someone to take wrong decision. Please think they have family too like you have. And people becomes protective to them by nature. I’m an employee (High School Teacher recommended by WBSSC) . I joined on 07/07/2011. But my service book yet not opened. I requested the Head Master several times to open my service book & also to prepare two copies. But HM neglected my request replying that it’s his business & when he will get time he will open only one copy of service book which will have to be prepared by the employee! So please publish one copy of notification about the GO of service book related school education department. Can you tell me the duplicate service book is being attested or original signed of concern D.D.O. ? If has any G.O. regarding original signed in duplicate service book ? Head of the office has not entered the date of conformation till now, what can I do? I joined in 2001as an assistant teacher (pass graduate) in a govt. aided junior high school which has become a high school and now it is a higher secondary school. on 1st July2002 I took the charge as teacher-in-charge. I have been released. from the charge on 24th Dec 2010. now I am working as an assistant teacher. There was no approval letter from DIS regarding the post of teacher in charge. In that case should I record the document on my service book regarding the temporary post of teacher in charge? who will be the authority to verify the service book when I was holding the post of teacher in charge? pls reply or post the reply on my gmail address. If the school authority forced the staff to acknowledge their receiving of the salary in an aquittance sheet without any authentic endorsement in it in place of aquittance register – what should be done? in case of non compliance what is the penal provisins??? Why govt employee are needing duplicate service book. I am also govt employee and serving since 26 years and do not felt any necessity of the duplicate service book. Really it is not required and not to bother for the same. Do your job best and serve in entire satisfaction of yourself. One Primary Teacher, refunded the share amount of CPF with interest to the Govt. through TR-7, but he some how lost his approved option ’85 form. We made an note entry of that in Service Book ant TR attached there. Is it right or wrong, what we did? Can u pl tell me the GO No. for teachers of a Govt.-aided school by which a teacher can claim to have a copy of the Service Book attested by the HM to himself/herself? What can a teacher do if the HM does not even open his/her Service Book for a couple of years after joining a permanent post? If the HM intentionally harasses a teacher? Is there any way out? Can a parateacher take one(1) year leave without payment? tell me the G O No. please write the G O for taking no of classes in a week for an asst. techer in secondery/HS SCHOOL. I had joined as Asst.Teacher in 1995 and due to negligence , my service book was opened after a long gap of 10 years i.e. in 2006 . Am I going to face any trouble for it afterwards? Moreover,no duplicate copy was made at that time and the previous Headmaster has also retired.So what shall I do regarding the duplicate copy? Please write the G.O. No. for teachers about servicebook. Hi, i’m Utpal Roy, working as Assistant Teacher (Pure Science) at Nagrakata Hindi Madhyamik Vidyalaya (HS), Nagrakata, Jalpaiguri. I am wiiling to come to places near Falakata viz: Birpara. Madarihat. Anyone interested for mutual Tranasfer Please Contact on E-Mail. sample copy of Service Book for the College Employees’ is urgently needed. I am SSC appointed assistant teacher and I have joined on 14th July 2011. But still I did not not got copy of my service book(even original copy is not prepared). When I have asked our teacher-in-charge, he told that our service book will be prepared after our confirmation. Is it true? Is there any such govt. circular in this regard? Also my post is “permanent post” as per ADI approval. So in how many years service will be confirmed? Generally additional post are confirmed in two years, so it will take 2 yrs in my case too? from some sources I came to know that permanent post are confirmed in 1 yr. Is it fact or just a rumor? Once one joins hm or tic is supposed to get service book ready. How to handle survice book of surplas teacher to the other school where the teacher is absorbed? my service has got missed out from school lockers, so can i know who is responsible for this? and i am having duplicate of it but thats not considering for my pay fixation and pension. so can u give any idea for What to do? Is it an official site of Govt. of West Bengal? If the HM declines to sign the duplicate copy of the service book, what can we do? Is there any rule insisting him to sign the duplicate service book? no provission of service book for contractual employee except attendence register. note down the full fixation calculation first.then write down basic pay + grade pay, pay band in evrey increment year like (10000+4200). the service book is available in any office stationery shop. getting receive copy of any letter as well as duplicate service bookis any ones right. use R.T.I. act if necessary. after getting approval from d.i. I’m a ssc appointed teacher in north 24pgs. Our headmistress/school authority does not agree to give us any receive copy of any application(not even the received copy of joining letter) as well as the duplicate copy of our service book. Is there any Written Govt Rule with GO number to get the received copy as well as the duplicate service book? In case of transfer , is there any time frame to send the service book to new posting place ? service record is essential for pensionary /superannuation/ death benefits, which varies on different ground which is recorded in service book. Only if contractual employee have any such benefit service book is relevant, otherwise not. Noting in service book is specified in wbsr for contractual employees specific rules are required for maintainence of service book. service book must reach the next office before next date on increment. please show me that after ropa 2009 how should we fill up our service book as a govt. aided school teacher. show the example of service Book for non Govt.Teachers. It is very clear that every full time employee must maintain a service book and require to verify it time to time by competent authority, but which is not clear is a contractual full time employee needs the same or it can be say he/she has the permission to maitain a service book?